Q&A with Sharon McSpedon: A Pilates Guru & So Much More! For 7 years, Sharon McSpedon has owned and operated The Pilates Barre on Grove Street in Ridgefield. Fusing two fitness modalities together has given McSpedon a fitness edge that her clients can’t get enough of. With too many certifications to count, at her core McSpedon is about whole body wellness best achieved when your mind and body work together. 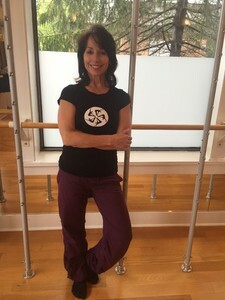 Here, we talk to McSpedon about The Pilates Barre, a culmination of three decades of teaching, training and connecting, as well as her diversified athletic and fitness background. I had been teaching for 24 years and the previous 6 year in my home studio. My business had grown exponentially by word of mouth and I knew that I had something to offer that was unique. It was scary to take on a retail space but I brought my clients to the new space seamlessly - and with a skeleton staff. I sent an email to everyone I knew in town (and then some) explaining that this was a lifelong dream and people just started to come through the doors day after day. At the time, I could only accommodate 9 clients in the large classroom, 3 clients on Pilates Reformers and 7 on spin bikes. Before long, I realized that the demand for Pilates was big! In 2013, we did some construction removing all the bikes, adding 12 Pilates Towers and 2 more Reformers. We were better able to infuse some of our Barre classes with Pilates. In 2015, I became a master trainer in Bodhi Suspension training and, with the addition of that, we began to offer Barre, Pilates and Suspension training in the same package. Our clients range in age from 14 to 75, from athletes and weekend warriors to newbies, we provide something for everyone. You received a full Mat and Reformer Certification under the tutelage of Pilates master, Marie Jose Blom. I’d say that makes you a Pilates pioneer! At 25, I was managing and teaching fitness at a small boutique studio on Madison Avenue. I was approached by an amazing woman who invited me to become a part of a small team of what she described as "elite teachers". She offered me an opportunity to become certified in Pilates and Barre (then referred to as the Lotte Berk Method). The process took several years, and included countless apprentice hours, but at the end, I was completely engrossed and started my own business. After completing my certification with Marie Jose, I was drawn to the possibilities of fusing Pilates with other disciplines. She [Marie Jose] was a dancer, Lotte Berk was a dancer and I was a dancer. I subsequently became certified in IMX Pilates which is a rigorous form of Pilates quite different from the classical Pilates I studied at the original Pilates studio with Romana K. My practice evolved, culminating with a 3rd Pilates certification from Balanced Body. What is Pilates? Can anyone do it? Does it make you sweat? Pilates is a system of more than 500 controlled exercises that condition the total body while engaging the mind. It's an incredibly balanced blend of strength and flexibility training that works several muscle groups simultaneously through smooth, continuous motion with particular concentration on strengthening and stabilizing the deep core including the back. Pilates is something almost anyone can do. A true Pilates or Barre practice focus on alignment and quality of movement and mastering of either protocol can be sweat inducing every time. Barre classes integrate the format of interval training with muscle-shaping isometrics that help to reshape the body. All of our classes use both the ballet barre, Pilates Tower and mat which makes us different from the rest. When we fuse our Pilates classes with Barre, you get the best of both techniques for functional strength and flexibility and a longer, leaner physique. Most days I get to work between 5:30 and 6am and start with private clients or semi-private groups immediately. I generally work straight through to noon or 1pm teaching 60 minute sessions or group classes in the larger classroom. I'm lucky enough to have a great desk staff who manage the business while I'm teaching but when I have a few minutes between sessions, I check in at the desk, make a shake or catch up with clients coming and going. By 1pm it's time to meet with my assistant who fills me in on the morning, return phone calls to prospective clients and deal with anything business related. I sometimes take sessions in the afternoon but I always want to be 100% and I know what my limit is. The work is invigorating, I love my clients and what I do but I'm hyper focused on each person, always talking, moving, analyzing and thinking. In my next space, I might have a little room with a cot to recharge! After work, I go home to my teenage sons who say I nag them about homework and cleaning their rooms but I think that's my job too. I don't ever see them going to school but I want to be there when they get home. After dinner, I am back at my computer responding to emails but lately I've been watching The Voice! Any Pilates Barre stories you want to share? There are so many. I feel like we have a community of wonderful people who come with a smile ready to work everyday. There's a great vibe, real energy and positivity and I'm so grateful. My staff is amazing and they are so professional and dedicated. I sent an email recently thanking our clients for all they are to us and for making our everyday experience so positive. The next day, I was talking to one of my assistants about how important it was for her to get to know everyone by first name. A moment later, two clients walked in. One began to tell me how the e-mail resonated with her and the other agreed, saying that from the first time she came into the studio, she felt so welcome, in expert hands and part of a community. This is what I wanted to create and this is what makes me the most proud.